...with a side of lime-jalapeno-spinach salad. It's time for a new way to do taters and yea I hath found it: hasselback potatoes. According to a user at AllRecipes (a top search result) this recipe originated in the Hasselbacken Restaurant in Stockholm, Sweden. I have no quibble with that assertion, though pass it on at your own peril. You may just run into a Steven Hasselback, a cyclopean giant of a man who lost his left eye inventing the dish in 1972. Some versions of this dish include cheese during the final stage. I do not. 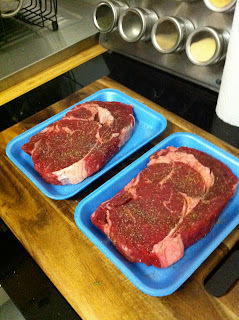 Pre-heat oven to 375 degrees and prepare a baking sheet or pie pan with parchment paper on the bottom. 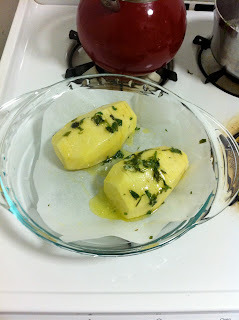 Over low heat, slowly melt the butter. 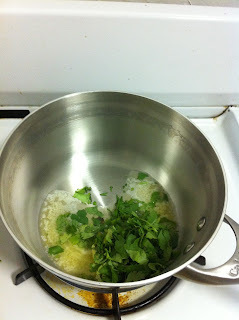 Once it starts giving you a bit of bubble, add the cilantro and cover. Cook another minute or two and remove from heat. This is the part where you get to create the signature look of this dish. There are a couple of methods of creating this. 1. You can slice a bit off the bottom of the potato to ensure it sits flat, then create slices about 1/8 of an inch apart across the potato, taking care not to cut all the way through. 2. There's also a method where you sit the potato in a large spoon and make the same slices mentioned above. 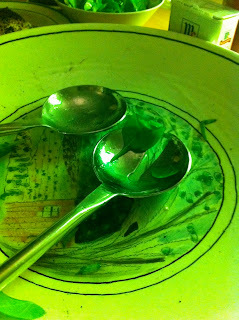 The rim of the spoon keeps your knife going all the way through. 3. Take a thin slice off of the bottom as in 1 above. Then place a chop stick to either long side of the potato. Make 1/8 inch slices. Spread the slices a bit with a paring knife. Then place the potatoes in the baking sheet or pie tin and brush with the cilantro butter mixture. Make sure some gets in between the slices. Then bake for approximately 45 minutes. Pull the potatoes out of the oven and pre-heat the broiler. 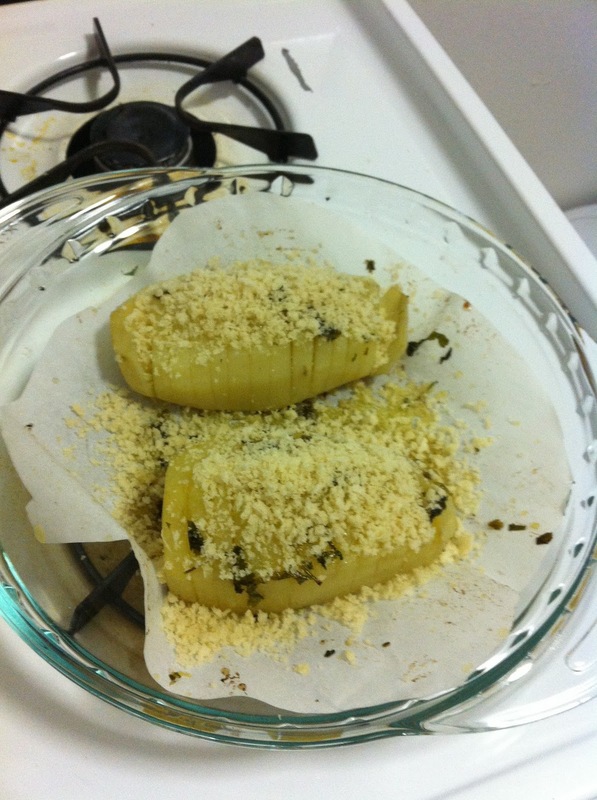 Brush the potatoes with the remaining cilantro-butter mixture, then spread the panko over-top. Place about 5 inches from broiler for 2 - 3 minutes. Now, should you choose to make the same dishes as I did together, you should season the steak first and let it sit out a room temperature while you take care of the potatoes. While the steaks are actually cooking you should prepare the spinach salad (it's quick). These were seasoned with salt, pepper, and a bit of coriander (I'm on a kick lately). Pass on the coriander here as it didn't add anything to the dish. 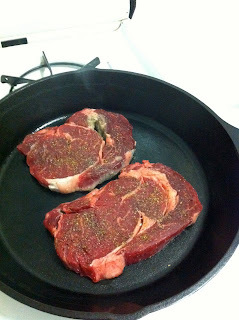 I pre-heat my iron skillet and place the meat directly on. As I've mentioned before that I like my steak rare, it should come as no surprise that I basically sear it for 2 - 3 minutes a side and that's it. And if you read that previous entry, yes, my skillet is finally properly seasoned. The Thrifty Sifter, for whom I created this wonderful meal, prefers hers medium rare, so she got the five minute treatment. 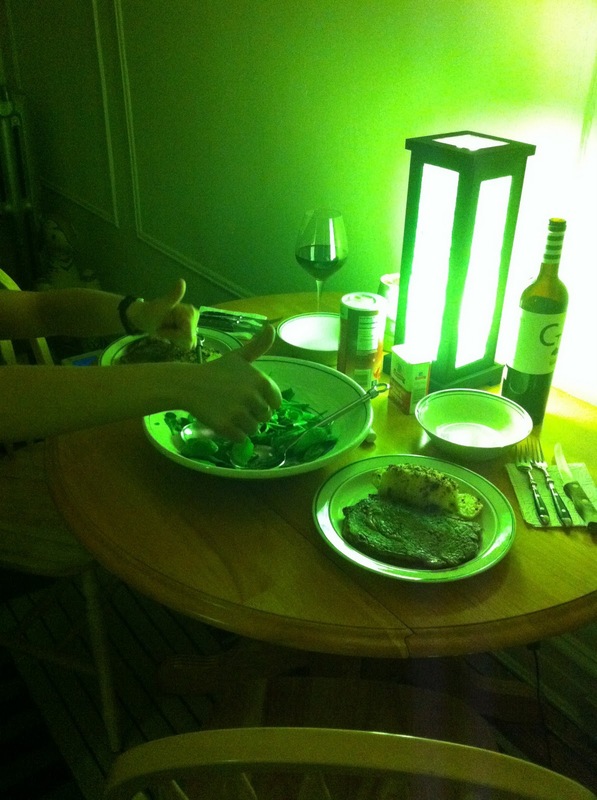 I forgot to take a good shot of the salad which accompanied dinner, but it's very easy. Once you have all the above ingredients, mix them up in a bowl and enjoy. This meal was Thrifty Sifter approved. Not even that spinach leaf was left. 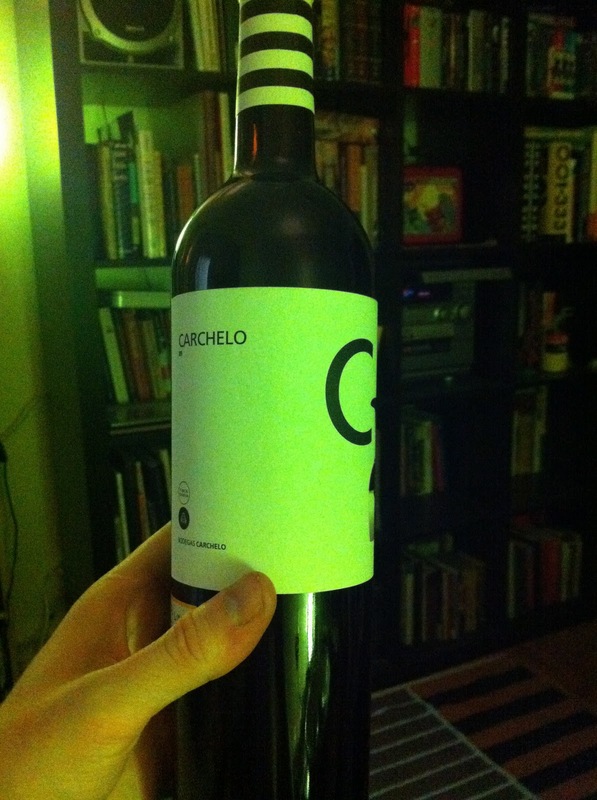 Served with a bottle of Carchelo red wine. It's a blend and Spanish.